But wait you say you have the job match preferences setting in your profile...but I don't believe these work correctly...I have these set in my profile yet the job search filters may / may not override them? But then when I check my job search preferences and do not set the job search filters the results I get do not match the criteria I have in my job match preferences. Or even better why doesn't it such that when I go to "search jobs" the settings from my job match preferences automatically load these filters so I know what I am searching on? Right now it is very misleading how any of this works. Is it using my job match preferences or is it using my job search filters? Which one overrides the other one and why are they not in sync? Ideal scenario is you get rid of this multiple way of doing this. Whatever changes you make to one it saves to the other...they should be just one setting after all. And when you first bring up the ui "search jobs" whatever is in your "job match preferences" (this is in your SO profile) should automatically load those filters that look like tags (the blue squares). It should do it automatically based on what I have already defined. If I remove something it should remove it from my preference and REMEMBER this value. Otherwise i find myself repeating searches over and over. There is ... kind of. You can use the "Recent searches" in the right pane to access your previously used search filters. 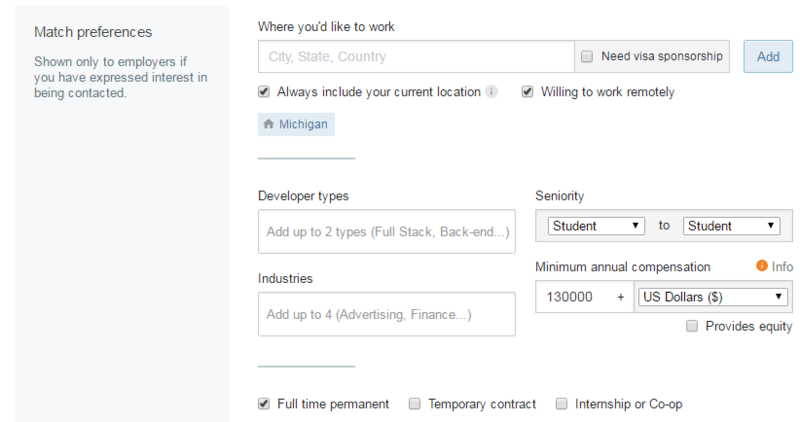 Is it using my job match preferences or is it using my job search filters? Which one overrides the other one and why are they not in sync? Job search filters are filters (indeed! ): they allow you to restrict the search results to certain criteria. To sort the search results when in "matches" sort. To sort the jobs in the job alert emails, and to decide which jobs to send you if there are too many. 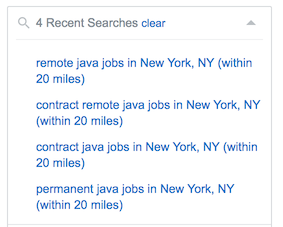 To give a concrete example, if you search for c# jobs in New York City (using search filters), and your match preferences indicate that you like redis, jobs with both c# and redis will be bumped closer to the top of the list. As you pointed out, this system is not perfect, and we are always looking for ways to make it better. One of the plans we have is to offer you, after you've entered search criteria, to populate your job match preferences using these criteria.